Today the color that everyone is thinking and seeing is green. A lot of people believe that if you aren’t a part of the solution, you are a part of the problem. If you are a business who is looking to be part of the solution, you are probably looking for a way to let your customers know. Look no further than CustomEarthPromos and our printed custom bags. Over the life cycle of a plastic grocery bag a lot of harm can be caused. It is estimated that U.S. shoppers use close to 100 billion plastic bags annually. The California Coastal Commission estimates that anywhere between 60 and 80 percent of ocean debris is plastic! This wreaks havoc on eco-systems and marine animals that either inhale or ingest the plastic. And contrary to popular belief, paper bags aren’t much better for the environment. Being a material that is so difficult to make sturdy, it actually puts more carbon into the atmosphere to produce one of those “greener” choices than plastic bags! 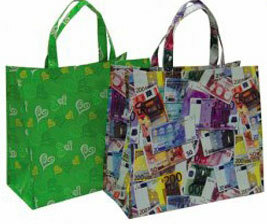 Offering your customers reusable shopping bags shows that you care about their environmental impact and our planet. Imagine having people associate your hard earned brand with being forward thinking and eco conscious. Our printed reusable shopping bags turn your recipients into walking, living and breathing billboards for your social consciousness. Our bags are a blank slate for you to fill with your image. With numerous designs and materials to choose from, you can make sure that your bag is noticed. Click to visit the site and find out about the different custom reusable shopping bags design options. Every time your precious customers reach for their reusable shopping bags, they will think of you encouraging them every step of the way to make wiser choices. Standing behind their sustainable decisions and cheering them on. They will know that they are more than just a dollar sign to you, but fellow inhabitants of this beautiful planet that we call home. We can help you show your sincerity for the cause, and that translates into dollars and cents. Whether you are in the market for reusable water bottles or custom bags, we have everything you need. Visit the site and find out about all that we have to offer. This entry was posted in Bags and Accessories and tagged accessories, bags on March 24, 2013 by Mommy Yam.